Enclave Hotels & Suites Orlando is a lakefront resort near International Drive where you get to shop from the Orlando’s best shops, eat from the best restaurants, indulge in the best of entertainment, and of course, have unending fun at the best of Orlando’s theme parks. The resort is at a walking distance from Wet ‘n Wild Waterpark, SeaWorld Orlando, Universal Orlando Resort and Walt Disney World Resort. The rooms and suites at Enclave Hotels look over a private lake and guarantees you all the modern amenities and comfort. The little ones too get their own rooms here. The hotel serves complimentary continental breakfasts, which will energize you enough to make a splash in the two outdoor swimming pools and the indoor heated pool. 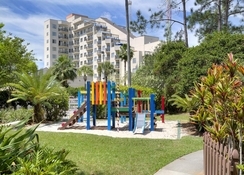 Enclave Hotels & Suites also offers kids’ pools, children’s playground, tennis court, gym, Jacuzzi, making it much more appealing than any other hotel in Orlando. 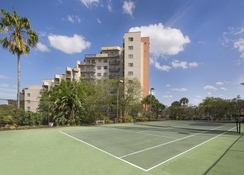 Enclave Hotel & Suites is strategically situated near the International Drive which means Orlando’s theme parks are just a minute’s walk from this stunning property. You also get to stay close to some of the best shops and restaurants. 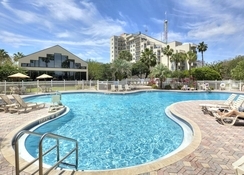 The nearest airport to the hotel is Orlando International Airport at a distance of 16 km. 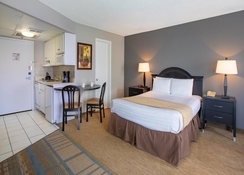 Extra-large rooms and suites await guests at the Enclave Hotels & Suites in Orlando. Executive Guest Room, One Bedroom Suite, Two Bedroom Terrace Suite and Deluxe Studio Suite – the accommodation categories are spread over for all budget categories and family sizes. The rooms boast stunning lake views, queen-size beds, Florida-style furniture, wireless internet, cable TV, microwave and refrigerator. Enclave Hotels & Suites is a foodie’s paradise. The on-site Food Court serves a wide range of dishes for entire families. Guests can enjoy the breakfast buffet or opt for ‘Grab n Go’ option if you’re heading out. The complimentary in-room breakfast is available between 7 am to 12 midnight. The Food Court also features a Pizza Hut®. The restaurant serves a selection of wine and beer. Besides, the hotel neighbourhood is full of fantastic cafes, restaurants and bars where you can sample some of the best of Orlando’s food. 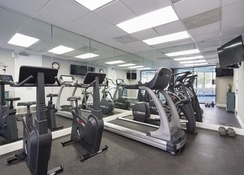 The hotel houses a 24-hour gym and flood-lit tennis courts for guests with athletic and fitness needs. 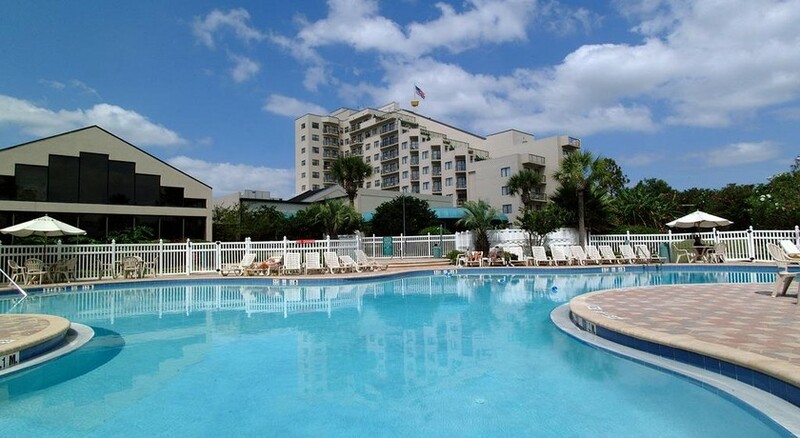 There are 2 huge outdoor pools, 2 kids’ pools and 2 whirlpools. The hotel also features an indoor heated pool, Jacuzzi and a gazebo overlooking a private lake. For young guests, the Enclave Hotels & Suites have a wooden playground and a kids’ club. You can also try your hands on the ping pong table in the gaming room. Orlando is a golfer’s dream land. Among 176 golf courses in Orlando, The Enclave Hotel and Suites takes you to the nearby courses. The hotel also arranges guided city tours and transportation to Disney theme parks. They are continuing the renovation and remodeling work at the Enclave Suites. As this stage of work may be more visible to guests we wanted to make you aware. Commencing next week, they will be working on parts of the outside of the buildings. This includes power washing the building exteriors as well as replacing damaged wall cladding before being re-painted. Some work on the roofs will also take place at the same time to repair damage from Hurricane Irma. Work will take place one building at a time and in sections with no rooms being used in the section being worked on. Work will only take place during the day. Subject to work schedules and weather, this stage of the work is due to be completed by the end of April. Our Guests may see or hear the work being undertaken during this time, however we will keep disruption to a minimum. Our outdoor amenities, including our two pools, will remain open. Whilst this stage of the renovation work will be visible we do not believe it will detract from your client’s enjoyment of their holiday and their stay with us. We will advise you with an update of progress on or before 15 March.